Step 2. जब आप sign up वाले button पर click कर लेते हो और दूसरे page पर पहुँच जाते हो तो आपके सामने कुछ इस तरह लिखा हुआ दिखेगा “Sign in to your Google Account or create a new one to sign up for AdSense. उसके लिए आप Google AdSense Ad Unit कैसे बनाते है और उसे WordPress पर कैसे Place करे वाला आर्टिकल पढ़े. 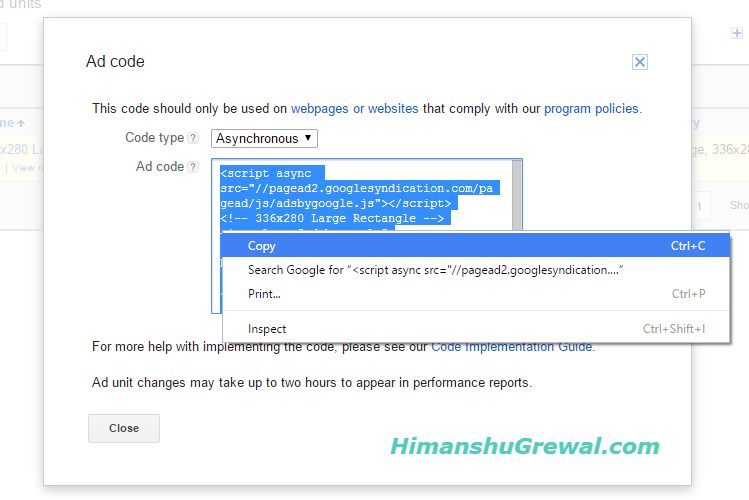 जब आप adsense.com पर जाते हो तो वहा पर एक code होता है उसको आपको अपने ब्लॉग/वेबसाइट पर लगाना होता है और जब कोई उस ads पर क्लिक करते है तो पैसे मिलते है. पैसे आपके बैंक अकाउंट में जाएंगे और आपके कोई भी पैसे नही कटेंगे. Very Nice Post with explanation, May i know your monthly earnings by adsense ? Sir Merko smjh ni aa rha h ki You tube ko bank account se jodne ke liye kya kya krte h or jod bhi liye to video ads ye sb your tube me dalte kaise h. Or Sir Adsense acount bn ni rha singh to up ke baad koi page ni khul rha h? 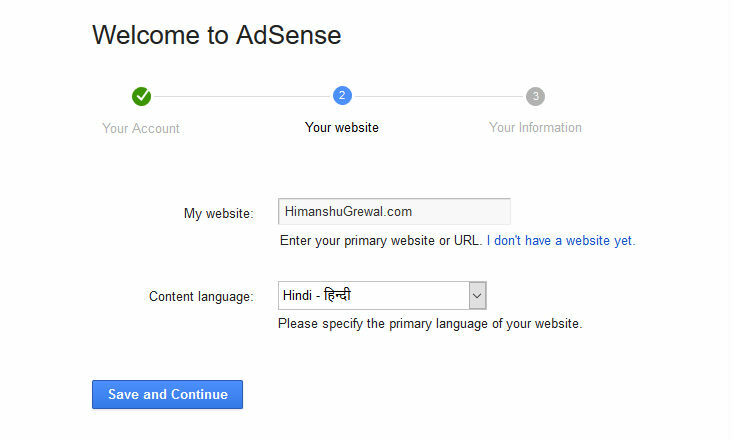 बैंक डिटेल डालने के लिए आपकी adsense.com पर जाना होगा, Ads लगाने के लिए आपको ad enable करना होगा इसलिए लिए आप online पड़ सकते हो. गूगल पर सर्च करो. YouTube par ads kaise lagaye. 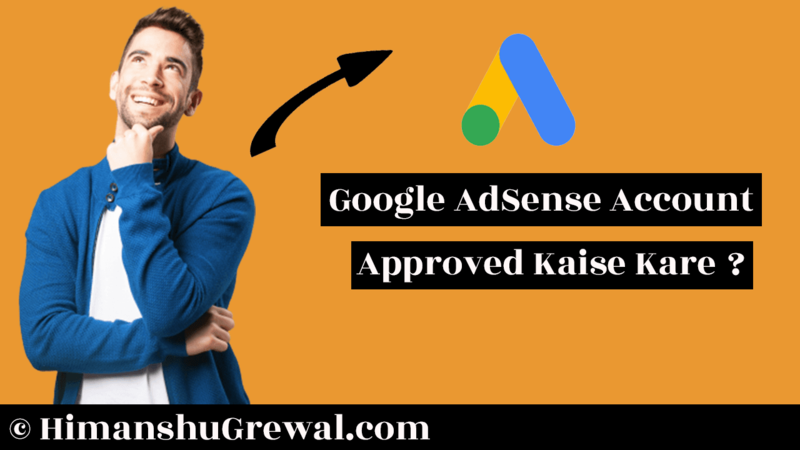 जब आप account create करते हो तो आपको adsense ad code अपनी साईट में लगाना होता है, फिर adsense team आपकी साईट चेक करती है. अगर उनको आपकी साईट अच्छी लगी तो वो आपका अकाउंट approve कर देगी फिर आपकी साईट में ads live हो जायेंगे. Pr sir adsense acount bn hi ni rha . Singh up now me click krta hu to uske baad koi page ni aa rha h ? एक बार आप किसी और browser में try करे नही तो history delet करके दूबारा प्रयास करें. आ जायेगा थोडा वेट करे. himanshu bhai apki site desktop me sahi se open nahi ho rahi hai theme me problem hai. Sir ji SupportmeIndia ke admi ji Ne to kaha tha ki adsens Hamare address par Dak bhejta hai.aur usme code aata hai. Vo code hame adsense me dalna hota hai. But apne to aisa kuch nahi kaha . To kya Hamare address par code ata hai ya nahi? Aur please bura mat manna ki hamne apke website par SupportmeIndia ke bare me discuss kiya. But answer fast dena sir ji. हांजी sir code आता है, पर इस आर्टिकल में मैंने जिस कोड की बात करी है वो अलग है. इस आर्टिकल में जो कोड है वो ads live होने के लिए है जो आपको सबसे पहले करना है. 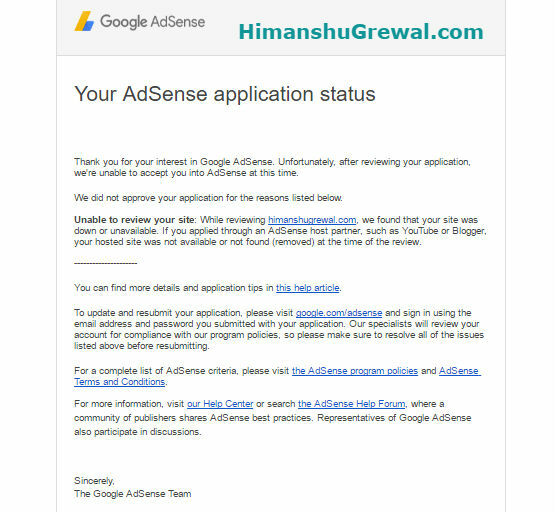 और जिस कोड की बात आप कर रहे हो वो adsense verification कोड है जो घर पर आता है. इस कोड को डालने के बाद आपके बैंक में पैसे जाते है, पर सबसे पहला जो स्टेप है वो मैंने इस आर्टिकल में बताया है उसके बाद जब आप 10$ कमा लेते हो तब आपको PIN के लिए apply करना होगा और आपके घर में कोड आयेगा. Bhut achhi jankari share ki aapne nice. Very nice post sir …Keep up the good work..
Bahut aChha article himanshu ji. Iske liye adsense approval ke liye kya kru ? 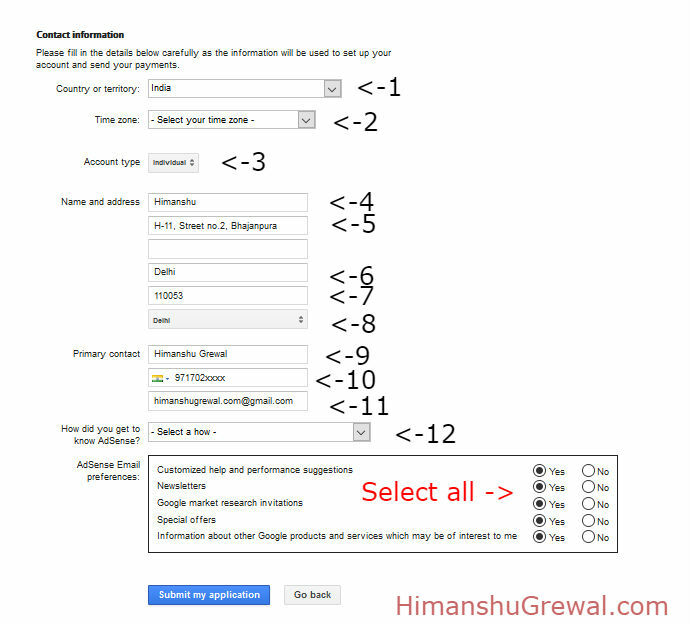 Google Adsense आप २ तरीके से प्राप्त कर सकते हो. sir-mere pass na websit na youtub hai sir-mujhe adsens me kam krke paisa kamana chahta hu. sir- mujhe rediment websit and ,applycation chahiy sir……pls. Grewal ji main continue 2 week se try kr rha hu lekin adsense account create nhi kr paa rha hu please help me. Sayad updation me change ho gya ho. main aapse ek jankari chahta hu ye meri site knowledgehindi.com hai aap ek par isse check kar ke dekh ligiye kya adsense ke liye apply kar sakte hei.koi problam ho to share kare. YouTube se banaya ja sakta hain. Har 1 Second Par Google Adsense Ki Team Aapke Uper Nazar Rakhegi. main aapse ek jankari chahta hu jaise adsense approved ho jane par kiya hum paid traffic use kar sakte hai aapne blog par. adsense kitne din me approval de deta hai? It’s depend on site quality. Hone ko to 4, 5 hour mai bhi approve ho jata hain. Address line 1 mai apne ghar ka pura address dale, line 2 ko rehne de. Disable adsense account hone par kia kare. Ek chhoti si jankari janna chahta hu adsense account disable hone par kiya kare. Kiya hum uss blog ke liye new adsense account dusri email id se bana sakte hai.jis blog par adsense disable hogaya tha. Ye problam kal raat solve huyi hai. hello himanshugrewal g thanks for your this information post nd thanks again this is very nice or deeply post ! Mai aapse ek information chahta ho Agar main clothes (कपड़ा ) se related site banaye to adsense approved karta haai. Kya mai apne adsense account se 2 website add kr sakta hoo? main aapse ek jankari chahhata hu Agar me shuse se relateds site banaye to adsense approved karta hai ya nahi.